As we sipped champagne in the Club Lounge at LHR there was no doubt that we were going to have a superb safari. We all knew each other having been to The Mara on previous safaris with Spencer Scott Travel and knew we would be well looked after by their host Liz Drake, and the bonuses this time were that we were returning to one of our favourite camps and teaming up with our friend of old, Jackson Looseyia from Big Cat Diary. We were a very happy ensemble of 6 lovely ladies. 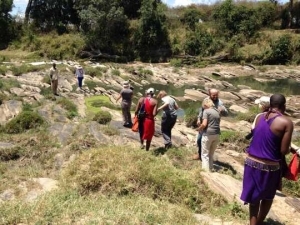 After a comfortable flight to Nairobi and without the need to change airports and travel across town, we were whisked through to our private plane and on our way to The Mara. Our first magical moment as we approached the airstrip was to observe a spectacular wildebeest crossing from the air! The pilot circled over the stampede and then Liz realised the crossing was taking place in our camp! What could be more exciting? Jackson was waiting for us with big hugs and kisses for everyone. The luggage was despatched to camp and we jumped in to our open sided safari vehicle and drove off for our first game drive. 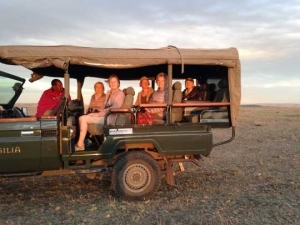 We had a 7 seater safari vehicle exclusively for us and with Jackson at the wheel and Liz in the front we all had plenty of space and a birds eye view for taking photographs. 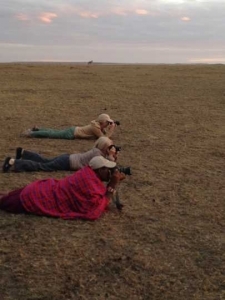 Cameras started clicking and our safari had started in earnest. A few hours later we rolled in to camp. We each had a luxury tent on the banks of the Talek River. 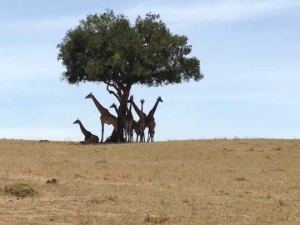 After hot bucket showers and time to unpack we lunched under the tree and watched wildebeest gathering for another crossing or not, as was the case. No time wasted we were back out on the plains. 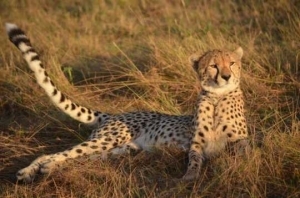 We found Malika, the cheetah famed for jumping on vehicles, with her three grown up cubs. The cubs are almost ready leave Mum but as we watched them miss a kill, it was clear that they were not quite ready to be independent. Later we saw 2 lionesses have a successful kill of some little hoglets. All this on our first day! In true bush style we enjoyed our first sundowners out on the plains as the sun sunk below the horizon. The day ended with drinks around the camp fire followed by a delicious dinner. Our tents had the option to be fully open to the night with netting or closed with canvas. 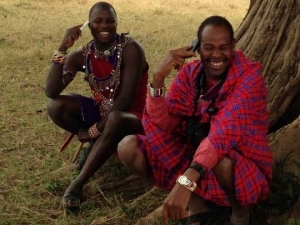 Either way you could not escape the wonderful cries, laughter, howls and grunts of the hyenas, buffalo and hippos as they wondered around the tents. 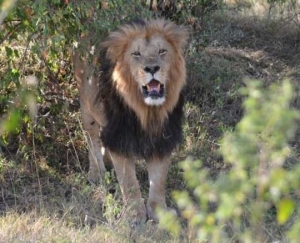 Distant lions roared – magical! The following morning commenced with early morning tea in our tents and then we were off just after 0600 hours to see what action there had been during the night. 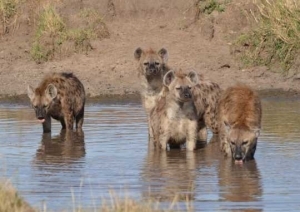 We immediately came across a group of hyenas with a young pup who was very curious of us. He boldly walked up to our vehicle sniffed the tyres and mudguards before loping off to join the others – this was a great photo opportunity. 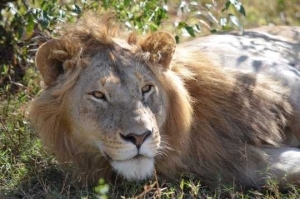 Next we came upon a pair of male lions – unusually one was old and the other young and Jackson was not sure who they were. Later we saw a small wildebeest crossing, observed an unsuccessful kill by a lioness and watched a lovely herd of elephants bathing. 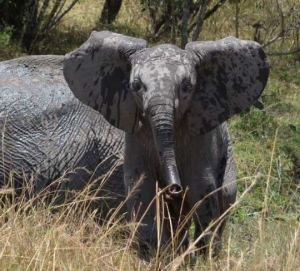 A mischievous juvenile elephant flapped his ears making himself look bigger and ran towards our vehicle, but lost his bravado as he got closer – another great photo opportunity. 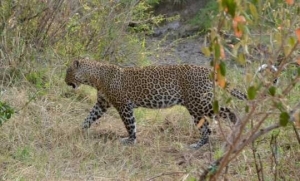 We also searched for a leopard with a cub but didn’t find them. We needed to head back to camp as it was approaching 1400 hours and we were already late for lunch……. We had crossed the Talek River earlier in the morning so it was decided to abandon the vehicle and cross the river on foot! 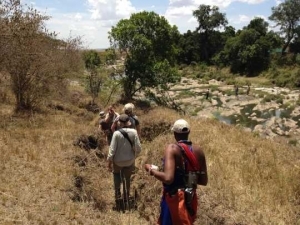 Jackson checked the banks for hippos and predators and the river for crocs and with the all clear everyone eagerly leapt out of the vehicle for the adventure. We climbed down the bank and had great fun jumping boulders to cross the river. All the camp staff ran to watch and help us, much to their amusement and amazement. After another splendid lunch under the shade of the trees overlooking the Talek River we were back out on to the plains by 1600 hours in search of more big cats. In the afternoon we found ‘Lipstick’, the beautiful male lion with an impressive dark mane that covers his shoulders and forearms, with a very attractive lioness, Malika and her 3 cheetah cubs and to top it all Bahati the leopard. All in all, all the big cats in one afternoon! Each day followed a similar format with plenty of action, great sightings and photographic opportunities plus impromptu surprises Jackson and Liz had organised for us. One day ended in style with us sipping sundowners on sofas that had been moved from camp to the banks of the Talek River – the ultimate room with a view, and one evening we had a lovely candle lit dinner in the garden. As has become a Spencer Scott safari tradition one morning we crept out of camp pre-dawn to find a hill from which we could watch the sunrise over Africa and toast our good fortune of being in such a magical place and sharing it with each other. The champagne corks popped with seconds to go before the natural silence that falls over The Masai Mara as the night ends and the sun rises over the horizon and a new day begins. We toasted the rising sun and had a few silent moments with our own private thoughts – very poignant. 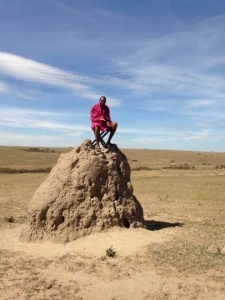 Jackson then did his traditional Maasai ceremony of touching the earth and then reaching up to the sky to thank nature for another day. 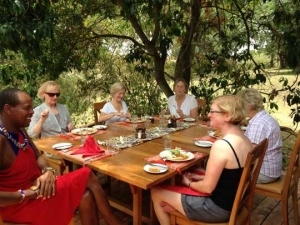 We even had a bush breakfast to surpass all safari picnics. 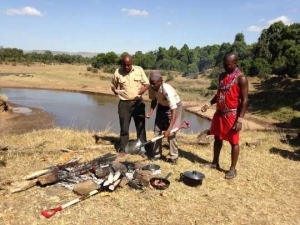 A fire had been lit on the banks of The Mara River and our breakfast was to be cooked al fresco. It was rather chaotic but great fun to watch Jackson and our two chefs frying eggs and bacon on spades over the open fire. Eventually a frying pan surfaced and our sunny-side–up eggs were perfect. We didn’t miss a moment or any opportunity to spend quality time with the big cats and other species. One morning as we headed out of camp we were privileged to spend a whole hour alone with Malika and her three cubs bathed in glorious light as the sun rose over the horizon. 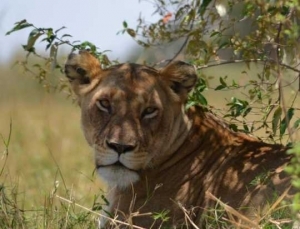 We spent time with members of the Marsh Pride of Lions and eventually found the leopard with her two cubs and their wildebeest kill in a tree – what a bonus find. We had wonderful encounters with a pack of hyenas greeting each other after a night of hunting, a little group of male giraffes hanging out under an acacia tree ( a perfect photo shoot), eland grazing in the distance (they are very shy), more cheetahs and lions with cubs and more predator kills. We watched in horror as three lionesses stalked a family of warthogs and successfully caught all three little hoglets. They then played with them like our domestic cats, before killing them. Luckily for one hoglet, its plucky Mum came back and challenged the lioness and managed to save it. Remarkably the little hoglet appeared undamaged and ran off to safety. We spent a whole day in the Mara Triangle Conservancy and were rewarded with stunning landscapes and seeing every creature great and small in one day except for rhino. 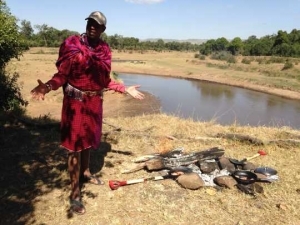 Sadly we also came across a hyena and a zebra that had been caught in snares and escaped, but with the life-threatening metal tourniquets intact. One of our final sightings was much happier – a beautiful cheetah family snuggled under a bush – mum with three tiny cubs. There was plenty of action happening in camp too – leopards Bahati and Golden Boy had a wildebeest kill on the opposite side of the river, there were several aborted wildebeest crossings but the gatherings were equally enthralling and then there was the pair of beautiful Malachite kingfishers and 3 Marabou storks that had taken up residence with us. 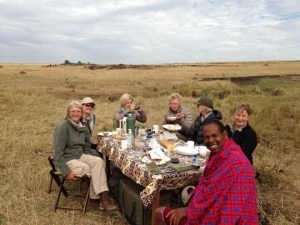 As our time in The Mara was drawing to its conclusion our final safari dinner was a special star-dinner with traditional whimbo dancing around bush fires with our camp staff – it was a bit of fun but one of those memories to dine out on. 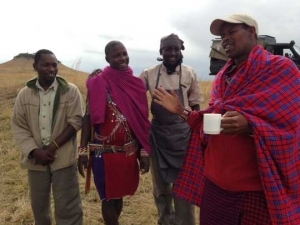 There was on last morning spent with Jackson in his ‘office’ before our private plane whisked us back to Nairobi. We said our goodbyes but without too much sadness because we left The Mara wanting to return and hoping we would be back soon. 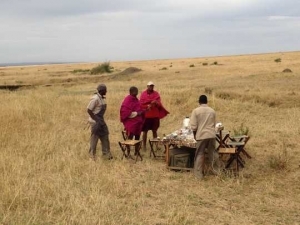 This was a near-perfect safari – making the most of what The Mara has to offer and enjoying unrivalled experiences delivered with understated sophistication by two professionals – Jackson and Liz..